Announced at an event in New York City earlier today, the television manufacturer proudly showed off the new 90-inch AQUOS high definition television, easily the largest LED television currently available in the United States. 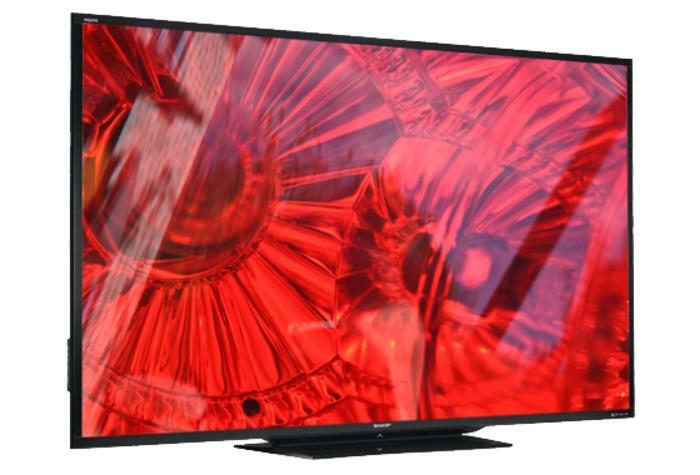 The 1080p Sharp LC-90LE745U in a LED-backlit set with a 120Hz refresh rate as well as Sharp’s AquoMotion 240 technology that helps avoid blurring images during fast-paced scenes in action movies or live sporting events. In addition, the television is ready for 3D playback and comes with two pairs of active-shutter glasses. 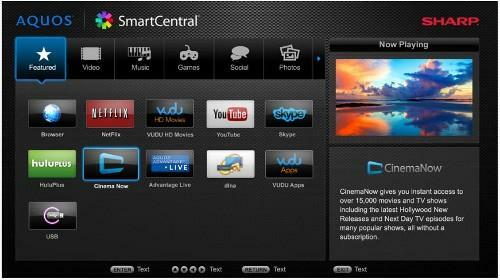 Using the built-in Wi-Fi, the Sharp SmartCentral user interface provides access to a standard range of applications including CinemaNow, Facebook, Hulu Plus, Netflix, Twitter, Vudu and YouTube. With an optional camera sold separately, users can utilize the Skype application to chat with friends and family members while in the living room. Related to the Wi-Fi connectivity, Sharp has included a service called “Aquos Advantage Live” that allows a trained technician to connect to the television remotely and accurately calibrate color levels. This could be particularly helpful when another family member screws up the settings when fooling around in the television menu. Installing the television in the living room isn’t going to be easy though. Similar to the heavy weight of older tube televisions, the Sharp 90-inch AQUOS weighs 141 pounds and is approximately five inches deep. Anyone thinking of mounting this behemoth on the wall should be extremely careful during installation. Nearly tripling the size of the viewing area compared to a 55-inch high definition television, the Sharp 90-inch television is surprisingly energy friendly. According to Sharp, the LED television consumes less power than two 75-watt light bulbs and the average owner should pay about $28 a year in electricity costs. However, the astonishing $10,999 price tag isn’t designed to help save consumers any money. Similar to the launch of the 80-inch models during CES 2012, the 90-inch is available immediately and will be carried at high-end electronic retailers.